PRINTING RECOMMENDATIONS: Screen meshes in the range of 74-230 are recommended for best opacity. Higher mesh counts can be used successfully depending on your requirements. Direct emulsions, capillary film or indirect stencil films are all suitable for screen preparation. Screens of 20 n/cm or higher are strongly recommended. If using lower tension screens adjust off-contact accordingly. Use just enough squeegee pressure to deposit the ink on the surface of the shirt. This enhances opacity and helps ensure a good cure. Try not to drive the ink into the fabric. Squeegees in the 60-70 durometer range, round or sharp edge depending on preference, work well. 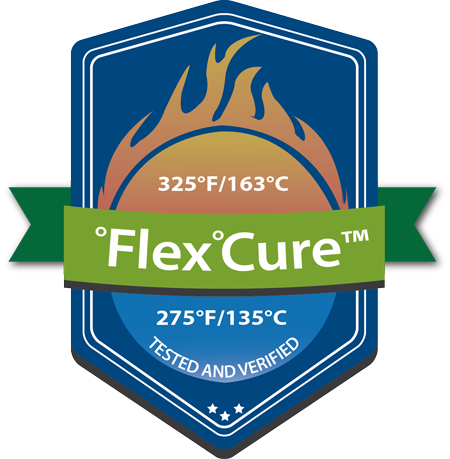 CURING: Recommended cure temperature is 325° F. (160° C.) for 60-90 seconds, depending on the curing unit and thickness of ink deposit. The ink film must be heated throughout to thoroughly cure. When thoroughly cured the ink is 100% washable. Low wash temperatures and cool dryer settings are recommended. Do not iron or dry clean. FINISH: Glacier Plus White cures to a semi-gloss finish. It exhibits a somewhat harder hand than XOLB-130 or XOLB-140. SUBSTRATES: Glacier Plus White is designed to provide maximum opacity on dark fabrics, 100% cotton or cotton/poly blends. It has superior "low-bleed" qualities. NYLON BONDING: If bonding to nylon garments use only 5% of MF-66 nylon bonding agent. More will thin the ink too much. Use within 24 hours once added. MODIFIERS: Glacier Plus White is ready to use. The soft and creamy formulation makes it easy for even manual printers. Modification is not necessary unless you're trying to achieve a special effect or use. Any extenders will affect opacity. QCM's DT-OI detackifier can be added at a ratio of 1-2% to reduce viscosity while maintaining opacity. Never more than 5%. CLEAN UP: Use mineral spirits or screen wash for ink removal from screens.